From bathing to cooking to cleaning, hot water plays an important role in your home. Because of this, being able to attain it with ease within seconds is an absolute necessity. When you navigate to a high-efficiency water heater from Swanton Energy Services, you’ll land more than hot H2O that perpetually flows for all of your home needs. You’ll also secure lower energy bills that feather your nest with the savings you deserve. What’s the Hoot About Hot Water? Your water heater’s performance should fit the bill when it comes to meeting your demands. This means delivering hot water when and where you want it, but in a cost- and energy-efficient manner. But here’s the thing: Water heaters consume more energy than a majority of your household appliances combined. So a reliable, affordable supply of hot water can be difficult to achieve. This is where Swanton swoops in to help. Offering three different types of high-efficiency water heaters, our units have the wingspan to heat up your H2O without burning your budget. It’s what we like to call taking down two birds with one stone. Our high-efficiency, standard natural draft water heaters are the traditional hot water tank design but with an increased energy-efficiency twist. 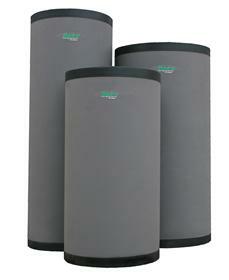 They remain the most popular and affordable water heaters on the market. Also known as tankless water heaters, these units work without the use of storage tanks. Instead, water is heated instantly, either with a gas burner or an electric element, as it passes through the pipe into the unit. This on-the-spot heating technique is 98 percent efficient and delivers a constant supply of hot water. Indirect tank water heaters work in tandem with your home’s boiler to heat water. Essentially, this type of water heater delivers a powerful one-two punch of energy use reduction and cost savings. From guiding you toward the right size system to laying out a flawless installation, we guarantee, with our team’s help, your hot water won’t crack under pressure. First, our professionals will use their expertise to find—and then flawlessly install—the high-efficiency water heater that fits your nest’s layout and matches your hot water demands. With the right unit and a proper installation, you’ll eliminate flighty warmth, decrease overall water consumption and save money on your water bills—month after month. We will ensure your water stays hot for all of your demands by keeping your system in tip-top shape through our thorough maintenance services and our swift water heater repairs. At Swanton Air, our warm and friendly professionals deliver the hot water heater services you need. To say goodbye to flighty hot water for good, fill out our online form or call us at 732-335-6731 today!